Unless we changed our minds, the front cover of this Journal is adorned with screen shots from an iPod touch. No, not from Apple’s new and much talked about iPhone 3G, but from a modest little iPod touch. 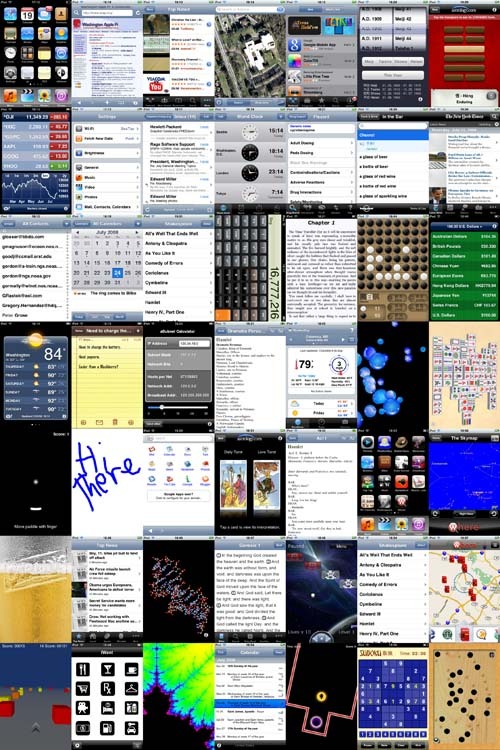 Collage of iPhone and iPod touch applications. Click on the image for a larger view. Apple pulled a fast one on the computer industry on July 11, 2008. With little advance publicity, the company released their iPhone 3G, and sparked headlines across the globe, not to mention long lines outside of Apple stores and mobile phone stores. Apple had announced long ago that the operating system for the new iPhone would also be made available, for free, to owners of the original iPhone and, for a modest charge, to owners of the iPod touch, but that didn’t draw much attention. All the industry analysts, pundits, and rent-an-experts focused entirely on the new phone; they showed no interest in the operating system. OK, maybe Apple didn’t pull a fast one. They told everybody exactly what they were going to do, and when, but the rent-an-experts were looking the other way. Admittedly, the iPhone 3G sounds like a winner. It adds faster over-the-air Internet speeds and a “genuine” GPS capability, and costs half as much as the original iPhone. You can quibble about the changes in AT&T’s contract, you can tisk-tisk about the activation hassles that people experienced in the first few days, you can listen to the pundits who say that, compared to the Blackberry or to various Windows Mobile cell phones, the iPhone doesn’t stand a chance. But it took Apple 74 days to sell a million of the original iPhones; it took three days to sell a million of the iPhone 3Gs. Forget all that. It isn’t important. What is important is the iPhone 2.0 operating system, which just so happens to run on the iPod touch, too. This new operating system opens up the iPhone -- both the original and the 3G -- and the iPod touch to a startling array of applications that turn this mild mannered mobile phone (or MP3 player) into a formidable shirt-pocket computer. Over that frantic opening weekend, despite the crush of buyers, the deluge of visitors to Apple’s Web site, and the chaos of converting from Apple’s .Mac service to the new MobileMe, users managed to download over ten million applications for the iPhone and iPod touch. The initial selection of 500 or so applications swelled to around a thousand by the end of July, and iPhone applications developers were complaining that there would be far more were it not for Apple being simply overwhelmed. Virtually every newspaper and magazine in the country, from The Wall Street Journal to The Washington Post to BusinessWeek, published a list of their 10 or 12 or 20 “best” applications for the iPhone. So what can you do with the iPhone 2.0 operating system and either an iPhone or an iPod touch? You can: carry around a copy of the Holy Bible (in multiple translations), a copy of the Quran, the complete works of Shakespeare, a network subnet calculator, a drug identification reference, an English-to-Mandarin translation dictionary (with sound), a currency converter, a copy of The New York Times, a remote control for iTunes, instant access to WeatherBug forecasts, a screen-sharing application that allows your iPhone or iPod touch to “see” the screen of your Mac, various utilities to find almost any conceivable merchant based on your location, a tip calculator, a sketch pad, a utility to help you update your WordPress blog, a transit map of the New York City subway system, a light saber (in case you are attacked by Sith), and countless games. For free. Commercial applications cover an even larger spectrum. Admittedly, some of the applications, free and commercial, are silly. Take iPint, a game where you slide a pint of beer along a bar; if you succeed, the iPhone/iPod touch “fills” with beer that you can then “drink.” Other applications are highly specialized like Gengou Free, which translates Japanese imperial reign years into European calendar years. Some are also just plain poorly done, or pointless. Still, the App Store (the place on the Apple Web site where Apple sells applications for the iPhone and iPod touch) has managed, in just a few short weeks, to turn a nice but not all that extraordinary mobile phone into a major mobile computer platform. And the same operating system (well, similar, at least) runs on the iPod touch, leading to an even more remarkable transformation. When the iPod touch was introduced, it attracted immediate attention from some, and yawns from others. The iPod touch can’t even approach the storage capacity of the iPod classic, and it is bulkier than the iPod shuffle and iPod nano. What it did offer was a much larger screen, which attracted the attention of those who take long plane flights. With a set of noise-reduction headphones, you can see and hear a better movie than whatever the flight offers, if it offers a movie at all. The iPod touch does come with Safari for Web browsing, Apple Mail for reading E-mail, and iCal and Address Book, so you can take quite a bit of your Mac with you in your shirt pocket. The Stocks function is OK, the Maps function is OK, the Weather function is OK -- but all of these require an active WiFi connection, which isn’t always available. For the most part, the original iPod touch is good for listening to music and watching movies and video, and sharing photos with unsuspecting victims. No more. Now, if your spouse is late getting off work, you can solve a few Sudoku puzzles, or guide a bee to collect flowers by tilting the iPod touch this way and that. You can use the iPod touch and Labyrinth (a very popular, free game) as a level, in case you have a wobbly table or are building a skyscraper. You can read Shakespeare, pop plastic bubbles, ride a cycle through a landscape of cubes, write notes, or annotate photos with silly squiggles. All without a WiFi connection. All without a telephone signal. All without an iPhone. Apple has done more than simply create a new mobile phone, or a more powerful, flexible iPod. Apple, through the App Store, has brought about a transformation of portable computing. Tasks that used to require a laptop, at least, can now be accomplished by a mobile phone or portable MP3 player. Instead of carrying business data around on a flash drive, where it is hidden away, untouchable and unviewable, you can now carry around the same data on your iPhone or iPod touch, and view and , yes, touch the data. Admittedly, the iPhone 3G is the bigger story. The over-the-air Internet access opens up a wealth of communications tools that an iPod touch can’t use -- unless it is within range of a free WiFi hotspot. You can take an iPhone into the middle of a swamp, photograph a rare bird, and post it to your blog, while still in the swamp; an iPod touch can’t do that. Just the same, the iPod touch’s universe is vastly larger today than it was when the device was first introduced. The world of mobile computing is vastly larger, because of the iPhone 2.0 operating system. We -- all of us -- have just made a significant advance toward a technological singularity, a world in which ubiquitous computing power can make a stroll through our neighborhood a learning experience, with information at our fingertips describing every bird, every plant, and every neighbor we encounter. Get ready. It will be quite a ride. One of the funnier aspects of the new iPhone 2.0 operating system and its interaction with the MobileMe service: this warning notice. After years of Mac users suffering indignities because Web sites were designed to work with Internet Explorer and only Internet Explorer, Apple quietly suggested that Windows get a “modern” browser, something along the lines of Firefox or Safari.